I had a great afternoon at Selina Lake's Homespun Market on Friday. It was lovely to see bloggers and designers I know, including Patchwork Harmony, Me Old China, Chocolate Creative, Decorators Notebook, Stylist's Own, as well as meeting Skin and Blister. I was pretty busy with my own stall (yeay!) so I just quickly snapped some phone photos (not all successfully) but you can find other roundups and photos of the event here, here and here. 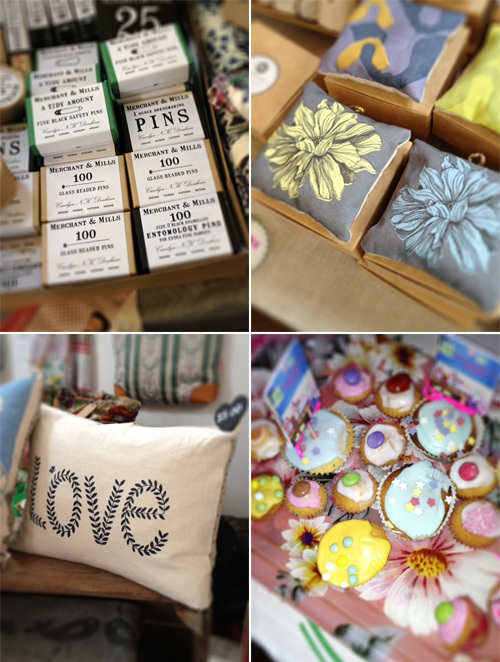 Merchant and Mills pins from Ray Stitch, lavender sachets from Abigail Ryan, Love cushion from Heart Zeena, cakes! Garish neon plastic flowers I surprised myself by loving, at next door's stall Folly and Glee, more lavender, again from Zeena, pretty washbags from Catherine Hammerton, Clare Nicolson's price board. I wish you'd give more dates for our dairy, I was away lately...If you have another market soon, let us know. 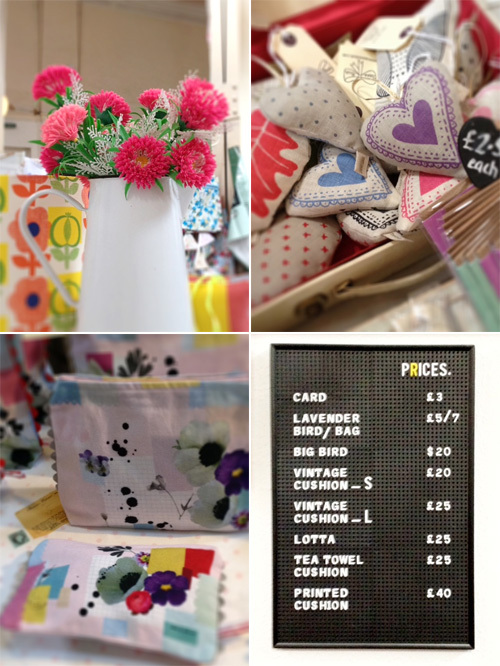 I came at the Vintage Market at Tooting broadway last winter, and enjoyed the venue and stalls a lot. It was lovely to see you too - I'm seeing Miss Ellie in Thursday so will mention Blognic The Sequel to her then. Nice pics too! Such a nice little craft fair. So sorry I only had a flying visit! Yippee sales....customers with taste! Oh, I wish I could have made it to london. The stalls look lovely! Such a lovely collection of things, wish i had longer there, just managed a quick shop after work, just enough time to buy a cushion!